HI, I AM SELLING MY BEAUTIFUL PAIR OF FEMALE CHINCHILLA SISTERS, THE WHITE ONE WITH DARK EYES IS CALLED LILY, AND HER TAN COLOURED SISTER IS CALLED ROSE. THEY ARE SUPER CUTE AND ARE FRIENDLY, THEY DONT STAY STILL FOR LONG BUT LIKE TO COME OUT OF THEIR CAGE AND EXPLORE. 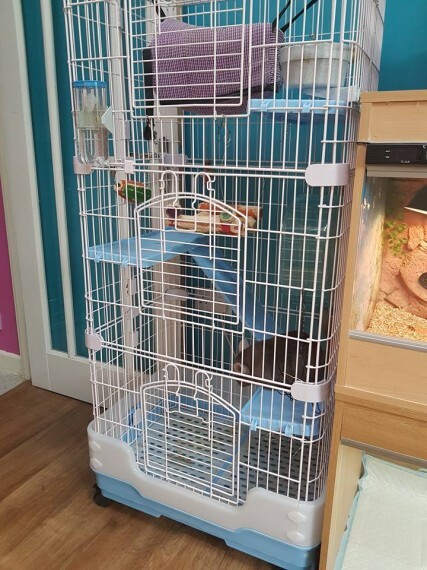 THE WHOLE SET UP IS INCLUDED, 3 TIERED CAGE, TOYS, FOOD BOWL, DRINKING BOTTLE, DUST BATH, SAND, HAY BALL, EXERCISE WHEEL, LARGE BAG OF FOOD. LOOKING FOR 5* HOME FOR THEM, MESSAGE,TEXT OR RING IF YOU CAN OFFER THEM A GOOD HOME.